The Grovely Parish takes baptism very seriously and very joyously! Baptism is the most important thing the church does. When we say “church,” we mean the people, the people of God. When you are baptised, you are marked as one of God’s own forever, you become part of the family. It is an enormous, amazing family – all those who have been baptised since Jesus Christ himself, two thousand years ago. In the Parish of Grovely, we therefore take baptism very seriously and joyously. Many families approach the parish for baptism for infants and we are delighted to be part of this significant action into God (for adult baptism, see below). We ask families (and Godparents!) who are interested in having their child/children baptised at Grovely, to prepare through an information session called “Come to the Waters”. These are usually held on the second Sunday of the month, from 3pm – 4.30pm, at All Saints’ Church. Since its inception at the end of 2006, “Come to the Waters” has proved very popular and a good time to ask any questions and become a little more familiar with the service. This is why we encourage both Godparents and parents to come – parents are automatically Godparents. Child minding and afternoon tea are provided by willing parishioners, and each family is allocated a “contact” person from the parish for any other questions or follow-up you may have. 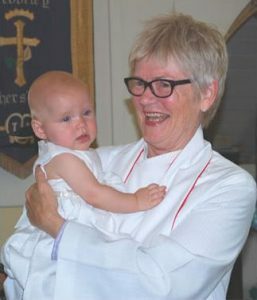 To inquire about baptism for your child, please contact Rev’d Jenny 07 3855 1314. She will book a date with you and arrange for paperwork to be sent out. We would then contact you to ensure you received the paperwork and to arrange attendance at a “Come to the Waters” session that suits you. There is no fee charged for baptisms that take place during service times, however donations are always gratefully received. For all out of service or stand alone baptisms, a donation of $100 is requested to help cover costs. We are also excited to baptise adults and, again, contact Rev’d Jenny if you are inquiring for yourself. Preparation for adult baptism, confirmation and reaffirmation is a process we name “exploring faith”, and it is very much shaped to suit the needs of those involved. For more information on Grovely’s baptisms, please download our Baptism Information Brochure (PDF) or contact us.